Reviewed by Wim Pelt, Department of Law and Cultural Studies, Open Universiteit Netherlands. Email wim.pelt (at) ou.nl. The European Union is a place blessed by geography. It is not often featured on the receiving ends in disaster stories. Yes, in the Union we have seen outbreaks of contagious diseases, storms causing damage, floods and active volcanoes. But they do not offer sufficiently shocking pictures to make headlines the world over. In most cases, the consequences can be dealt with locally by the member states that are all in the richer half of the world, and so they cannot be described as global matters. 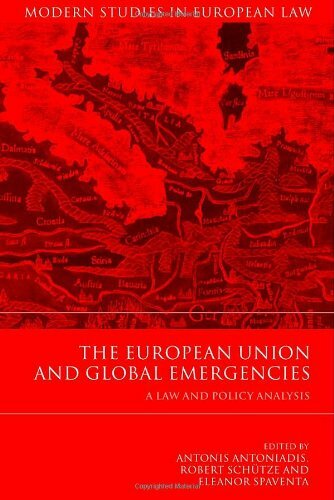 The title of this book led me to expect that I was to learn, how the EU deals with world-scale catastrophes such as tsunamis and 9/11, world-scale disasters, mostly occurring elsewhere. This is only partly the case: among the "global emergencies" dealt with we find a large number of pages dealing with such matters as the British mad cow disease. What you see as a global emergency might be influenced where you sit. This book is a collection of extended and re-worked papers presented at a conference at the University of Durham European Law Institute, UK, on May 8-9, 2009. A warning for political scientists: the papers are all by lawyers and that shows, though about half take politics explicitly into account. Most of the authors have been affiliated to the University of Durham at one time or another in their career. Financial and personal support from the EU to the conference is acknowledged. After a general introduction summarizing the papers, the book is organized in three parts: Constitutional Challenges, taking as its point of departure the primary and secondary EU law, Thematic Challenges, a series of cases studies, and the Perspective of the Institutions, presentations by Legal Advisors to EU bodies. Interested readers in a hurry can best start with Part III. These papers are the most lively written and are fully on topic. And this is not an introduction to the usual lament on unevenness of collected papers: almost all contributions are self-consistent, scholarly, well annotated and present original research. In this book, the terms "emergency" and "crisis" are often used as synonyms. The common core is probably: events that require measures to be put in place faster than the normal legislative timetable allows. And what is that timeframe? The main features of the EU budget are fixed for 6 [*530] years. Within that budget, legislation can take as little as 6 months and as long as, well, decades. Major legislation in most cases takes 2-4 years from white paper to Official Journal. In summary, events requiring measures within a year qualify for being called emergencies. Why does decision making take so long in this group of (compared to the UN) like-minded states? The Schuman Declaration – whose influence for Europe has often been compared with that of the Declaration of Independence for the US – states upfront, that "Europe will not be made all at once, or according to a single plan. It will be built through concrete achievements which first create a de facto solidarity. "(translation from http://europa.eu/about-eu/basic-information). Initially, in 1951, this was applicable to the pooling of the French and German Coal and Steel sector, and since then, to the ever increasing number of policy domains where the member states have decided to join forces or found themselves (sometimes to their surprise) as having transferred sovereign powers to a more or less limited extent to the Union level. The member states often reacted grudgingly to the state of affairs they found themselves in, and agreed to stay on the road to "an ever closer union" on condition of a procedure that maximized the possibilities of national oversight – at the cost of delays. The Treaty of Lisbon entered into force on December 1, 2009, half a year after the conference and (almost) all references to that treaty are now in the present tense and to the European Communities in the past tense. The final word of what the clauses of the new Treaties mean in their present context lies with the Court of Justice of the European Union. As cases normally take two to three years to judgment, we will have to wait quite some time to see whether the interpretation of the authors is correct or not. The first paper is by Marise Cremona, Professor of European Law in the European University Institute. She discusses the four main crisis management instruments of the EU ‒ humanitarian aid, stability instrument, civil protection and peacekeeping (in EU jargon: Peterberg tasks (named after the Bonn suburb where a European Council first decided that peacekeeping is within the remit of the Common Foreign and Security Policy)) ‒ and how they are founded in the treaties. The two non-crisis instruments that are often used in emergencies, the EU powers in food safety and health (though the Union shares for the latter field responsibility with the member states), are given a more summary treatment. Her analysis method is parliamentary history: almost all references are to Union publications. For a paper clearly meant to set the scene and probably the opening address at the conference, this is understandable. The next paper is by Sir Alan Dashwood, Professor emeritus at Cambridge University. He knows the EU both from theory and from practice, as he has often appeared in the Court of Justice of the EU for the UK and for private parties. Maybe this is the reason why his references are often to the judgments of that Court. Dashwood notes, that both different [*531] European institutions and member states often were wary about infringement on their privileges, even when dealing with crisis management. At least up to the Treaty of Lisbon, most member states guarded jealously againsttransfer of sovereignty to Union bodies in the field of High Politics (Defence and Foreign Relations); these matters are dealt with in what was called the second pillar, in a manner closely resembling other international organisations, different from the much more supranational community methods that are used in what was called the first pillar. Dashwood and also Wouters (see below) argue, however, that in the treaty of Lisbon the pillars have been merged without anyone noticing in the traditional European way (sometimes called the Monnet way; Wiener & Diez 2009 is the classic text on this subject) with which so many other policy domains have been brought within Union competence. The development relations with former colonies were dealt with in the (supranational) community structure rather than in the (international) structures the Common Foreign and Security policy before the Treaty of Lisbon already. In which of these two areas falls assistance to states recovering from civil war with the destruction of small arms, to create a more stable post-conflict society? Dashwood argues provocatively that this depends on how well the aim of the measure is described in the preamble of the decision in terms of the treaties. The solution seems to me rather that such a decision falls under CFSP when it is to be executed in the Balkans, under Community rules when in Africa. I have already mentioned the long time the normal legislative procedure can take in the EU. In many government organisations, flexibility is increased by delegation. The third paper by Robert Schütze, Professor of European Law at Durham University, deals with the EU non-delegation doctrine. Schütze coins this phrase to indicate, that the general rule in EU matters is, that no delegation can takes place. Normally, only what are called implementing powers can be delegated, preferably to the Commission. When desired, the Commission can be obliged to consult a committee of national officials. All exceptions must be carefully explained, to the satisfaction of the European Court of Justice, especially when delegation is to bodies not mentioned in the Treaties. Sometimes in a field where the Union has not yet legislated and action is urgent, the Court accepts that a member state acts as a trustee of the Union, but only when the member state acts in good faith and closely cooperates with the Commission. While these three contributions are mainly legal in content and approach, the eight case studies that follow take politics also into account. Although war and civil war within the EU are almost unthinkable, this does not mean the the larger region is a quiet place. North-Africa, Middle East and Caucasus are within a few hundred miles of the EU borders. R.A. Wessel and S. Blockmans, professor at the University of Twente and the University of Leuven, respectively, review several cases in which the EU has tried to assist in resolving the many armed conflicts on its doorstep. Often a state is considered to be partial by at least one of the parties [*532] in a dispute, so an organization like the EU is better placed to assist in the dispute resolution techniques mentioned in Chapter VI of the UN Charter. Whether the EU is a regional arrangement as meant in Chapter VIII of the UN Charter is a matter for debate. The EU has pledged itself in numerous places to the Purposes and Principles of the UN. On the other hand, the EU is a kind of international organization that can hardly be foreseen by the Charter's drafters, which had only the OAS in mind when drafting Chapter VIII. Where the EU could use the carrot of membership, it has achieved a moderate level of success: in the former Yugoslavia and in the case of the Baltic states. Elsewhere, the results have been mixed at best. But then, so have been the results of UN intercession. Eleanor Spaventa, Professor of European Law at the University of Durham, traces the first part of a continuing saga called Kadi. In several countries persons on the Security Council list of suspected terrorists have asked courts to review this listing, as Abdoulrazik in Canada. In 2001, Kadi asked the EU Court of First Instance to annul the decision that "froze" his assets for an indefinite time (probably very long, if not forever). He argued it violated his civil right to property, that is part of EU law (at the time via the constitutional law of all the member states, now as part of the Founding Treaties). The Court of First Instance finally found in 2005 it was unable to review what was, for whatever faults it had, in essence a decision of the Security Council. Unfortunately, this Court is used to dealing with matters as competition law and not with matters of international law with political ramifications, so it will come as no surprise that the verdict was, well, not very motivated (in fact, for three years I used the 2005 decision as an exercise at the end of the introductory course in International Law to find the four main errors). The decision was appealed, and in 2008, the Court of Justice upheld the appeal in a way hardly polite to the lower Court. The Court of Justice found, that requiring reason publicly given and summary juridical review would not go against the obligations to comply with binding Security Council resolutions. It gave the Commission 4 months to amend its decision. Here ends the story as told in this book. For those interested in the next round: the Commission amended its decision, again including Mr Kadi in the list of persons whose accounts are to be frozen, but now giving reasons. Mr Kadi appealed this decision again in 2009, and in 2011 it appeared that the General Court (formerly the Court of First Instance) had not taken the criticism of the Court of Justice kindly: it stated that the Court of Justice had erred in requiring summary review only, found it had power for full review, reviewed the Commission material, found the reasons given insufficient and so obsolete as not further warranting freezing of accounts, and annulled the Commission decision. The Commission appealed this verdict, and again, the Court of Justice found in July 2013 many and important errors in the judgment of the General Court, but as summary review would have led to the same conclusions, it upheld the verdict. Peter D Cameron, Professor of International Energy Law at the University of Edinburgh, traces the story [*533] of a treaty never ratified: the Energy Community Treaty. Its aim was to guarantee free flow of energy, even in the face of disputes between a supplier state and a transit state. The EU, Ukraine and Russia were all to be signatories. But when in a conflict between Ukraine and Russia the former interrupted the gas flow to the EU, the conflict was solved by old-fashioned diplomacy and not by reference to the procedures foreseen in the draft treaty. This lowered the enthusiasm for this mechanism, and it is not likely the treaty will ever be ratified. Jan Wouters, Steven Sterkx and Tim Corthout from the University of Leuven Centre for Global Governance investigate the way the EU exerts influence in global institutions as the G20, the IMF and the World Bank. In the G20, the EU has its own seat, as have the four member states France, Germany, Italy and UK. But in IMF, World Bank, ILO, WTO and OECD only states are members. Still, the EU can use Common Positions to coordinate and streamline input from members, and greater coherence could lead to increased influence. The authors are convincing advocates for the position, that the Treaty of Lisbon has provided tools for such better coordination, but only time can tell. The article by Antinis Antioniadis (the solicitor, not the footballer), Legal Counsel to the European Ombudsman and writing in a personal capacity, is a piece of special pleading. He blames the current Greek crisis on opportunistic speculations of financial markets, which did not at once lower interest rates on loans to Greece when the Greek government confessed it had fudged figures for more than 20 years but promised it would never so so again. I think nobody could expect creditors in such a situation to act like nothing has happened, and moreover, in my view, markets are not supposed to be kind or even rational. Antoniadis also calls German papers prejudiced when one dares to call this fudging lying. The description of the bail-out negotiations is interesting, but peppered with statements as summarized. Another article that I probably do not fully understand correctly is that by Caoimhin MacMaolain from Trinity College, Dublin. He claims EU food policy since the BSE crisis is wrong, as it is more geared to food safety than food quality and seems to solve that by devoting not only more attention to quality, but also less attention to safety! I agree that objectively speaking, obesity is probably a greater threat to life than BSE, but obesity does not make headlines, while BSE does. Moreover, obesity is by many not considered a disease – the USA has only recently given up the fight to keep it from the WHO lists of pandemics. And while BSE can be transferred by a single item of beef, obesity is coupled with a multitude of factors. Another problem I have with his argument is that he puts the blame on the EU. As regards overreaction to BSE, the examples he give are more overreaction by member states than by the Institutions. And that only verifiable dangers to health can be used to claim restrictions to the free movement of goods on the ground of public health seems to me only logical. Alessandra Arcuri from the Erasmus University Rotterdam analyses recent WTO Panel decisions on food safety, and notes a shift from requiring [*534] quantitative factor analysis to a more holistic approach. This reflects current trends in risk assessment in how to deal with unknown and/or uncertain risks. While this is an interesting paper, it seems out of order in this collection. But reading is highly recommended! Overall, this is a collection of interesting studies on special topics of EU law, some closely related to global emergencies, some less closely while other seem to be prepared for other reasons than this conference. But all papers address the difficult field of Foreign Policy between the Union (both in its international and its supranational guise) and Member States, and as such, I find it stimulating to more research. A. Wiener & T. Diez, 2009. EUROPEAN INTEGRATION THEORY, Oxford University Press. Copyright 2013 by the author, Wim Pelt.